As you may know Microsoft specifies the bandwidth of Azure VMs with low, moderate, high, very high and extremely high. As Yousef Khalidi, CVP Azure Networking, has written in his blog post in March, Microsoft will provide specific numbers to each Azure VM size in April. When our world-wide deployment completes in April, we’ll update our VM Sizes table so you can see the expected networking throughput performance numbers for our virtual machines. 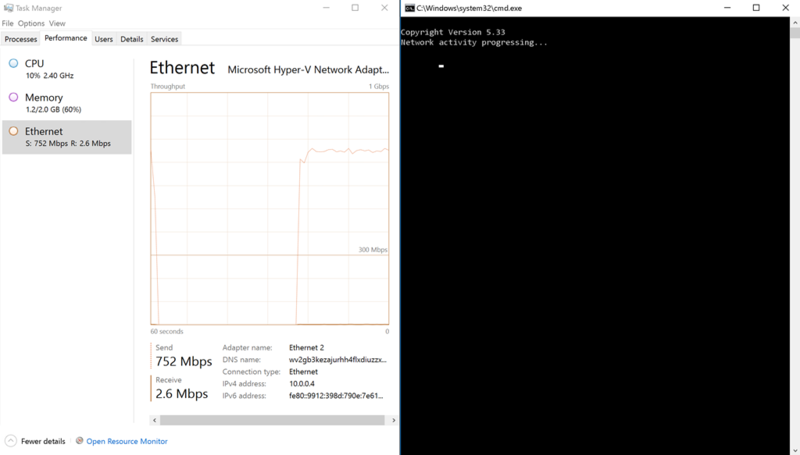 I have run some network performance tests on each F-series VM size to get the numbers for it. For my tests I have used the NTttcp utility by Microsoft. Both VMs were deployed as F1 to start the tests with and were running Windows Server 2016. Before running the tests it is advisable to disable the Windows firewall on the systems. Here are the results for all F-series VM sizes. So you get an idea what you can expect, when you are reading network bandwidth is high. But keep in mind that depending on the CPU cores the network bandwidth varies. The most powerful VM size regarding network bandwidth without the use of RDMA is the D15_v2 with the accelerated networking option. I am looking forward to the specific numbers to get published in the Azure documentation as I mentioned and quoted it at the beginning of this blog post. This entry was posted in Azure and tagged Cloud, IaaS, Microsoft Azure, Networking, Public Cloud on 19. April 2017 by Daniel.